Amarygia parkeri is a rare hybrid between Amaryllis belladonna x Brunsvigia josephinae. So think Naked Lady Bulb on steroids and you will get the picture. The flowers are white, large, and very slightly fragrant. A pink flowering form is also available. You will see bulbs offered as Amarygia parkeri alba as well as Amarygia parkeri ‘Hathor’, this simply means the flowers will be white. The flower stalk appears in late summer, tall to around 50cm, the flowers appear in a large umbel atop the stem. Around 12 individual white trumpet shaped flowers on each stem. This is a spectacular plant when in flower, the bulb itself is large and sits with the neck well above the ground level similar to the Brunsvigia. Amarygia parkeri will grow welling the garden or in a container. It requires a well drained soil at all times to prevent root problems. If growing in a container choose one around twice the diameter of the bulb. The plant will put out offsets and eventually these will need to be divided. It is best to wait for the offsets to get to a good size before dividing, this may take 3 years. 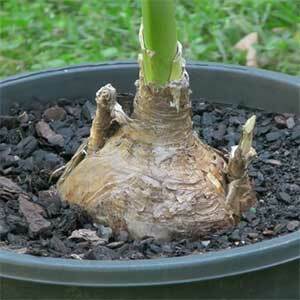 In the meantime you will need to pot up the whole clump, offsets and all to give the bulbs room to grow. We grow our Amarygia parkeri in the open, it receives afternoon light shade. In deep shade the flowers tends to reach for the sun and the overall appearance of the plant is spoil. We fertilise with a liquid seaweed fertiliser in mid summer and again as soon as we see signs of growth. Once the flowers have finished the leaves will appear, they need to be left on the plant until they die back naturally. They will pull away easily when they are ready, so do not force them. This is a bulb that likes dry conditions over winter, ours are left outdoors and we simply check that they are not to wet. In very wet seasons we sit a pot tray over the top during dormancy to assist. 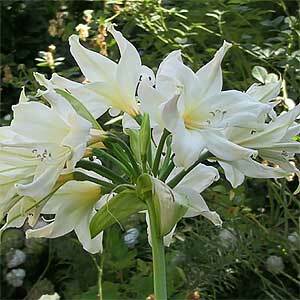 These are a tough hardy bulb once established as long as they not exposed to wet soggy soils and frosts.